And I'm a Feelies fan! Were those on the 12" with the Beatle covers? There was a good version of Powderfinger by the Beat Farmers, but there is no fundamental point in covering Neil. Even Cash's Pocahontas seems a bit perfuctuary. And anyone for that horrible Like A Hurricane by Roxy Music? Not to mention The Mission's. neverknows wrote: 'Sedan Delivery' is on The Good Earth. They did 'Barstool Blues' too, for a French promo CD. 'Powderfinger' I'm not sure. They used to play it live; it might not have come out on a record. As Slider notes, there's not much point. They didn't add anything to the song except the novelty of it being done by them. That's okay in a live setting, but not really for a studio record. Didn't Loop do 'Cinnamon Girl'? Saint Etienne did 'Only Love Can break Your Heart'. The Slider wrote: And anyone for that horrible Like A Hurricane by Roxy Music? Probably the worst thing they ever did, wasn't it? Except for maybe their cover of Jealous Guy. Completist or no, I still refuse to have that "The High Road" record in my collection. Beno wrote: Saint Etienne did 'Only Love Can break Your Heart'. That's a great one. Completely different in style to the original but it works really well and doesn't come across as gimmicky. You'd think it was just that his simplicity and individualism makes his own versions definitive and all others completely superfluous (as I personally think the Pixies' Winterlong is - it is a carbon copy). But then there is Bob Dylan. And there are hundreds of brilliant interpretations of Bob's songs. I don't know why, it is just is. The Slider wrote: You'd think it was just that his simplicity and individualism makes his own versions definitive and all others completely superfluous (as I personally think the Pixies' Winterlong is - it is a carbon copy). Interesting. I was thinking about posting something about being creatively crippled by respect, but then that wouldn't explain the abundance of decent Dylan covers, as the man is accorded more respect than any other rock/pop musician. Personally I'd like to hear Frank Sidebottom take a stab at Rockin' in the Free World. Corporate Whore wrote: Personally I'd like to hear Frank Sidebottom take a stab at Rockin' in the Free World. It'll be an improvement over the version I saw Neil do with Pearl Jam at Reading some years ago! That version was rotten. You know it was! It really was! Geoff Cowgill sums his appeal up quite succinctly in the opening post. The Church do a decent cover of Cortez The Killer on A Box Of Birds, their covers album, but then they can do no wrong for me. There actually is a recorded version by Feelies side project Yung Wu, opening their Shore Leave album. Ah yes, maybe that's what I'm thinking of. I get those acts a bit confused twenty or so years later. They also appeared as The Trypes and perhaps in one or two other incarnations I don't recall. We used to see them a lot when they played here regularly and one nice thing about the bands was that they always seemed to play on (U.S.) holidays. So if you didn't have anyplace in particular you wanted or were obliged to be, you could always go and see one of their bands with a bunch of other fans, and it was a cozy sort of experience. 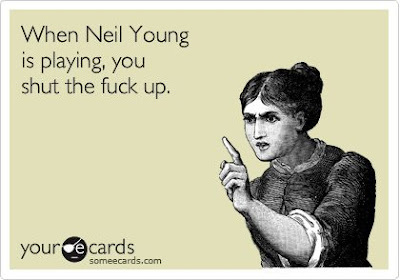 neverknows wrote: Maybe Neil Young is more a performer than a songwriter. Dylan is (was) both, his own versions of his songs are often definitive, but many songs clearly have (had) pop / soul / etc potential. Put on Solomon Burke's 'Maggie's Farm' in a party and only those who know the song will think 'Dylan'. It is always great to tell the others: 'You are actually dancing to a Bob Dylan song'. With Dylan all the great cover versions seem to be of his more stripped back and less musically involved songs - Ferry's Hard Rain, Hendrix's Watchtower, The Byrds Mr Tambourine Man/My Back Pages, Rod's Tomorrow is a Long Time etc etc . No one ever did an interesting version of anything off Blonde on Blonde or Highway 61 did they? I take your point, and for the most part agree, but I think Nina Simone's "Just Like Tom Thumb's Blues" is the exception to this. I still say St. Etienne's Only Love Will Break Your Heart stands as a brilliant cover. There is always an exception or two to the rule. I like Madeleine Peyroux's take on You're Gonna Make Me Lonesome When You Go as well. NS's JLTTB is a pretty radical reinterpretation if I remember rightly isn't it? Almost like an opposite of the other songs - she strips it back where the others all build the bones of just the voice and acoustic guitar up to some huge great cathedral of sound. Just playing it now - it is exactly that. Chris Chopping wrote: I still say St. Etienne's Only Love Will Break Your Heart stands as a brilliant cover. I'm not sure I would go as far as brilliant, but it is certainly one of the very few NY covers that might be considered succesful in any way whatsoever.